Posted by Olivia Haider in Events, World Space Week. People from all over the world are invited to send us a rock from your local area to be combined together in a Earth Master Sample. What is Earth Master Sample? To celebrate the theme of World Space Week 2013 – Exploring Mars, Discovering Earth – people all over the world are being invited to submit a fist-sized rock from their local area to form part of an ‘Earth Master Sample’. 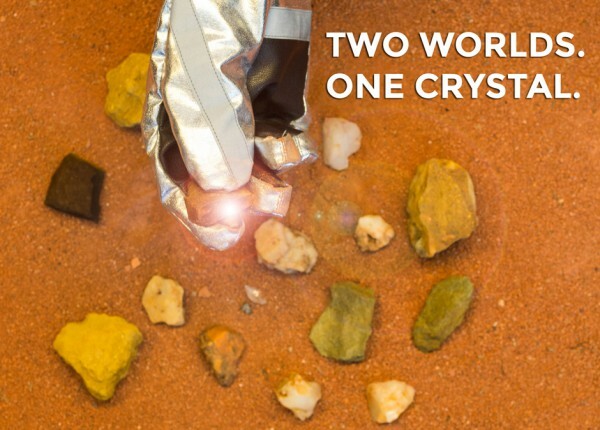 A fragment from each of the resulting collection of rocks will be ground to a powder, mixed together with a Mars meteorite, and melted down by leading crystal producer, Swarovski, who will craft a unique set of 100 crystals to commemorate the event. The crystals, which will be unveiled by Swarovski at the Yuri’s Night celebrations on 12 April 2014, will be presented to representatives of space agencies, policy makers and thought leaders around the world. By participating in the Earth Master Sample Campaign, you are showing your support for understanding more about our Solar System through the study of Earth analog sites and for future Mars sample return missions that will help us decode the history of the Red Planet. Crystals will be presented to heads of Space Agencies, policy makers and thought-leaders, as a symbol of the importance of these goals for space exploration and for humanity. Follow the seven simple steps below to collect your rock and send it for inclusion in the Earth Master Sample.